Brigid Hanrahan's multi-disciplinary practice includes painting, drawing and ceramics. With a focus on the creation of fictional narratives, Hanrahan works with subject matter found mostly in domestic settings such as animals, gardens and people. 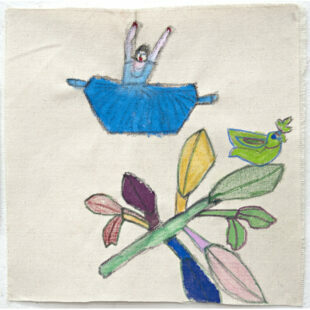 Dancers also appear as a common theme throughout Hanrahan’s work, in particular those from the Australian Ballet. Her figurative interpretations are delicate and expressive, often evoking a lyrical sense of movement and storytelling. 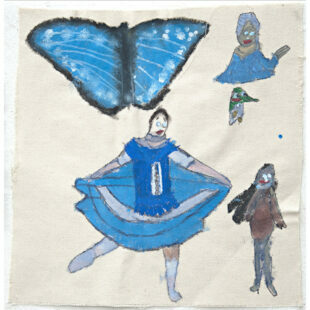 Brigid Hanrahan (born 1972) has been a regular studio artist at Arts Project Australia since 1999. She has been included in numerous group exhibitions including Melbourne Art Fair, Royal Exhibition Building, Melbourne (2000, 2002, 2008 and 2012), Pearls of Arts Project Australia: The Stuart Purves Collection, National touring exhibition (2007-2009) and Home Sweet Home: Works from the Peter Fay Collection, National Gallery of Australia Travelling exhibition (2005). Her work is held in the National Gallery of Australia and Tallis Foundation collections.